An emerald stone is enchanting in its own right, but set in this ring from Apples of Gold, it takes on even greater beauty. The captivating stone measures 6mm and casts a lively green sparkle. Vibrant yellow gold is up to the task of holding the emerald in place with style. Two yellow gold swirls allow the gemstone to sit above the band, and with white gold for a foundation, the band also offers a nod to fashion, but in the equally enchanting art deco design. 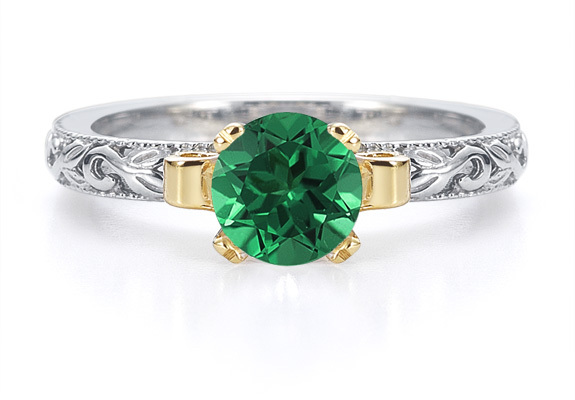 We guarantee our 1 Carat Art Deco Emerald Engagement Ring to be high quality, authentic jewelry, as described above.